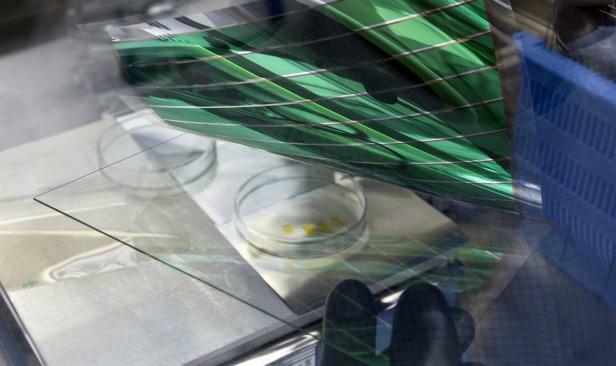 German startup Heliatek has developed a new kind of solar panel made of small, organic molecules deposited on polyester films. The technology is similar to what’s used for OLED displays for phones and flat-screen TVs. The panels are flexible, and far lighter than conventional solar panels, yet in some locations, particularly where it’s hot or cloudy. These panels from Heliatek will be far more efficient compared to polymer-based ones, and are tipped to have a lifespan that is similar to that of a conventional silicon solar cell. The organic solar panels have a conversion rate of approximately 8% of the energy in light being transformed into electricity, which is slightly more than half that of conventional solar panels in terms of the efficiency range, although in cloudy weather or hot environments, the organic solar panels will be able to perform on par as the conventional panels end up being less efficient then. Heliatek, based in Dresden, is funded by Bosch, BASF, and others, and has raised 28 million euros so far. The company, which recently started making its panels on a small, proof-of-concept production line, hopes to raise an additional 60 million euros, part of which will be used to build a 75-megawatt factory. This is fairly small for a solar panel factory at such a small scale, Heliatek’s panels will cost more per watt than conventional solar panels, says CEO Thibaud de Seguillon. But in four to five years, by which time Heliatek should reach large-scale production, the cost could drop to around 40 to 50 cents per watt, which would make them competitive with conventional solar panels.